You are here: Home » MEDIA » Books » Andromeda Spaceways Inflight Magazine # 58 (magazine review). 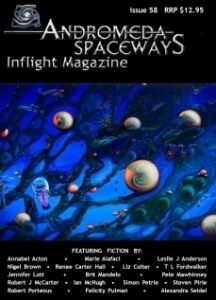 Andromeda Spaceways Inflight Magazine # 58 (magazine review). The journey continues for ‘Andromeda Spaceways’, this time with a magazine edited by Edwina Harvey, who is noted for her novels which include ‘The Whale’s Tale’, reviewed some time ago on this website. I’m pleased to say that once again we’ve got substance and quality with no less than 14 good stories, plus poetry, an article and book reviews. There seems to be a slight tendency for tongue-in-cheek (though that may not be the right phrase to use) reproduction rights amongst slithery alien creatures as exemplified by Simon Petrie with ‘Suckers For Love’, which is written in his usual imitable style and also Pete Mawhinney’s ‘For The Love Of Slarck’. Simon Petrie considers relatively intelligent mating rituals between octopus-like creatures on an alien planet and the consequences of their unions while Pete Mawhinney takes the side of the alien, a slimy creature at that, when humans first arrive in Earth’s vicinity. The good, the bad and the ugly in many respects. Very entertaining! Starting from absolutely nothing, a boy stares at his bedroom ceiling to build up complex science to the point of creating cold fusion. Steven Pirie’s story entitled ‘The Bedroom Ceiling’ is quite absorbing, even for the landlady. It’s all done with little regard for public safety. Then we’ve got talking chickens. Okay, makes a change from talking cats and maybe the author, Marie Alafaci, was eating at KFC when writing ‘Non-Smoker, Good Sense of Humour, Must Like Chickens’, but it has turned out really well done. Good to read, it describes a talking chicken being involved in the mating ritual of two humans. Funny and quirky and it was very well crafted. More aliens, this time rather difficult to pin down and a bit slushy, forgive the pun, when dark snowmen interfere in a civil war. Ian McHugh’s ‘Grey Snow In The Shadows’ takes us on campaign with a family containing small children being entrapped in the fighting between government forces and freedom fighters. Good stuff! Then we have Robert Porteous with a long story entitled ‘The Tale Of Kasim And The Alchemist’ which begins with caravans in the desert. Interesting and well-written, it’s enthralling to the end and is probably the most substantial of the stories in the magazine. We’ve got stories about ancient Greece, spaceships running out of air and also time travel with Nigel Brown’s piece called ‘Reunion’. In the latter, three middle-aged friends meet up for the school reunion to find one of the former classmates appear apparently not having aged. It seems to be that he has time travelled to give them a message. What message? Lots of other good stories, too many to mention in this review, but rest assured they are all satisfyingly good. The article about the late Iain M Banks was interesting, likewise the reviews. The passengers of the spaceship will be hard-pressed to find anything to complain about when receiving issue number 58. Let’s hope the journey continues in the same manner. « Guardian Of The Freedom (Merlin’s Descendants book # 5) by Irene Radford (book review).